Whitby Public Library will re-present the 3D presentation that was featured at the library in October for the DPCUC. 3D printing is opening a world of opportunities, revolutionizing science, technology and manufacturing. 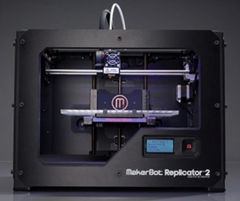 The library will be demonstrating the new and exciting technology of 3D printing during Maker Month. Join Anthony Bayat for an overview of 3D printing and see objects created in a matter of minutes from a basic digital design. The Library is using the MakerBot Replicator 2X experimental printer and will be printing objects from digital designs from the ThingiVerse.